Macagba: Better than high grades? THESE past few days, I have been finalizing the grades of my students. As part of the process, I have been doing various grade consultations with them so that I can promote transparency and at the same time accountability among them. Grade consultations might be stressful at times since you need to allot a good portion of your time to accommodate students, who at times cannot help themselves to question or complain a little. 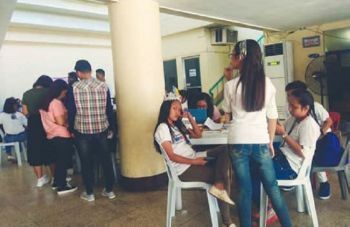 But I appreciate these hectic and busy moments since these are the times that I get to witness or even measure the levels of my student’s growth, which the yardsticks of classroom assessments cannot evaluate. For one, I see the level of humility of my students. I have students who before they even see their grades would tell me how bad their performances are. But as the one receiving these apologies, I get to appreciate and understand that they are not just making excuses because they have plans to improve what they think they lack. I have also been a witness of students’ simple joys such as just making sure that they pass, they increased their grade even by a point, or that they have maintained a line of 8 card grade. It may be simple but I do feel that their happiness is sincere and even untainted. Some may call it mediocrity, but for me it tells me how students have that inner power of acceptance that goes beyond the expectations of the people around them. I have also witnessed students who prevent themselves to be defined by the grades they received. I believe that while grades show us a certain mastery of competency, there are certain life skills and competency that I will never cover in my subjects or even schools in general. Thus, I admire students who transcend from getting high grades to those who give their best, learn as much as they could and become better persons in the process. I must say that growing up I have been very competitive and grade conscious. But I have seen students, who realize that there is more to schooling than grades. Likewise, while the usual yardsticks of achievement and success indicators are generally accepted by society, I will always admire and be inspired by those who can transcend from gaining the tangibles and work for the unmeasurables like values, ideals, and principles. In a society that focuses on targets and concrete evidence, I realized that there’s more to life that cannot be quantified and most of the times, these are the things that matter. Sometimes we promote too much the attainment of the concrete manifestations of the measures or targets we wish to pursue that we compartmentalize the output from the process and that we fail to see what matters more to us. As we promote the attainment of these targets, we then create a culture of hate, cheating, and even a careless disregard to the well-being of peoples. I remain hopeful that more than the achievement, may we appreciate the effort, the process, the sweat, the sacrifices, the persistence and even the passion to pursue because I totally believe that not all good things or valuable aspects of life are measurable.